Elegance is hard to find, especially when it comes to boardroom furniture, where there’s usually a lot of clunk and power posing. With an ash boardroom table, however, you’re guaranteed to rediscover that sense of effortless style and timeless refinement that defines the sophisticated business owner. Our products are an embodiment of this concept, especially with their marriage of delicacy and durability that can be built to accommodate any sized team. Whatever your needs, they can all be met with an ash boardroom table from Mac&Wood, the quintessence of style and sophistication. Ash is a beautiful material that is delicate and hardwearing. It is perfect for boardrooms that need a light-coloured feature piece to brighten the ambience and unify the aesthetic of the space. It’s ideal for softening the bold elements in your office, bringing everything into alignment and imbuing your workspace with a sense of calm refinement. As with every one of our creations, our ash boardroom tables are all about beauty, strength, individuality and utility. We can make your tables as large as they need to be and we help you to create a masterpiece that’s truly your own. Our brushed stainless steel frames are perfectly created to reveal the natural lines and colours of the wood, giving each piece a modern yet classical appeal. In short, the subdued, classic appeal of a Mac&Wood ash boardroom table is elegance defined. This beautiful statement piece is an investment that promises lasting returns. Requiring almost no maintenance and able to withstand the very roughest treatment, one of our ash boardroom tables is an enduring time capsule bearing witness to your company’s growth. Perfect for those important meetings with managers and clients, it also creates the ideal space for light-hearted conversations with employees. As with anything that’s truly elegant, ash adapts as it needs to without ever feeling out of place. 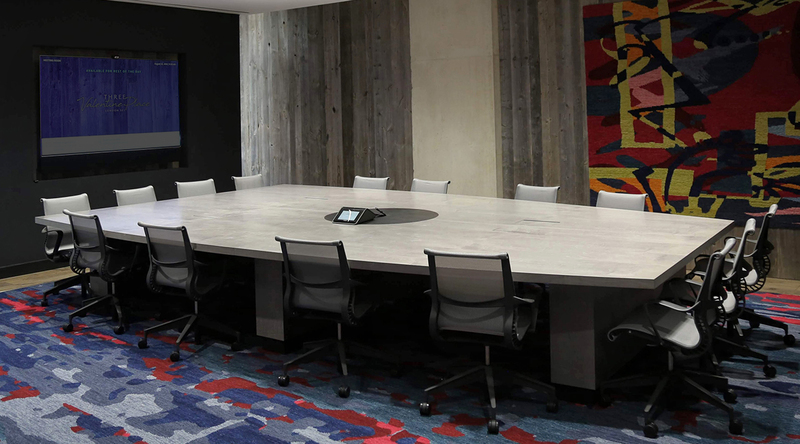 By entrusting our experts to create a tailor-made ash boardroom table for your business, you can be assured that it will perfectly enhance the atmosphere of the meeting space, diffusing its aesthetics through the entire company – effortlessly.